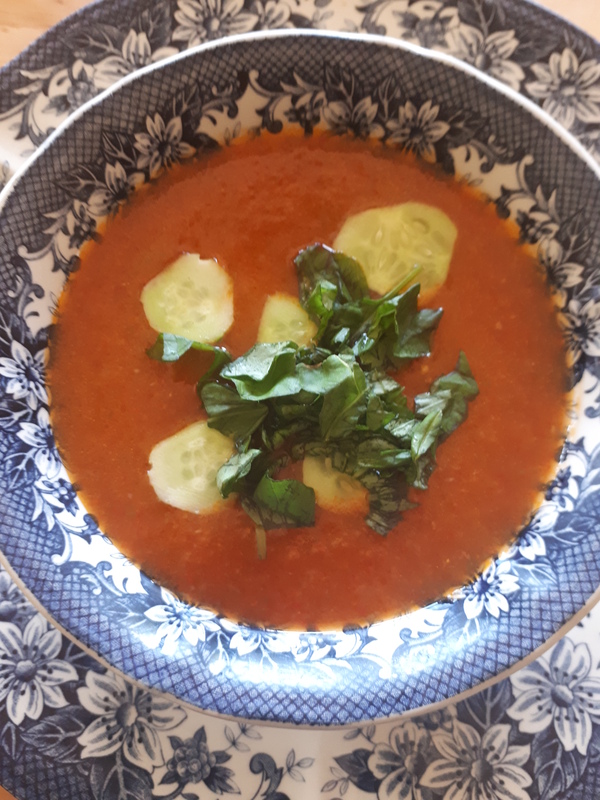 Today I thought I’d do something really different and share a couple of recipes for cold soup which I’ve been making quite a bit in the recent heatwave we’ve been having and which have helped to fuel my writing! They’re made quickly using the pressure cooker(thus not heating up the house too much) and they are so refreshing, nutritious and delicious well-chilled, either for a main for lunch or for a dinner entree. The first one is of course gazpacho, probably my favourite cold soup and one my mother used to make to perfection. This is my version, super quick and easy, with a Basque touch to it in honour of my ancestry, and which never seems to fail 🙂 Make it the day before to eat the following day. Ingredients for 2 or 4(if for 2, it gives two helpings; if for 4, 1 helping each): Three largeish ripe tomatoes or seven small ones; 1 good-sized capiscum, either green or red(the green one adds a subtle kick, the red a mild sweetness); 1 large cucumber or 2 smaller ones; 5 garlic cloves; one medium sized onion; handful basil, parsley, and garlic chives(or other mix of herbs as you like–though not rosemary as overwhelms other things too much); olive oil; salt, pepper, one and a half tablespoons vinegar, one tablespoon brown sugar, teaspoon piment d’Espelette(beautiful fruity and slightly spicy Basque pepper powder which you can get from specialist online stores like The Essential Ingredient–if unavailable you can use paprika instead, with a tiny bit of chilli added); and finally, tomato juice. Chop all ingredients. In pressure cooker, heat some olive oil. Add all the ingredients except the tomato juice, stir for about a minute or so. Add the tomato juice so that it covers everything(but no more than that) and close the pressure cooker. Cook for 15 minutes at full pressure, then let cool till you can open the cooker(or run cold water over it to hasten the process). Then either blend the contents of the cooker, or crush with a potato masher and put through a sieve, crushing well to get every last bit of goodness out! Let cool, then put in fridge overnight. Serve decorated with chopped basil and/or slices of cucumber. In contrast to the deep red of gazpacho, the second cold soup recipe I want to share is for a green soup. This versatile soup can have many variations, depending on the ingredients, and you can experiment as you wish. Here are a couple of variations I’ve tried. Version 1: Ingredients: 1 large cucumber, 1 large potato, garlic, onions, handful herbs-I used mint, thyme and tarragon—salt, pepper, stock(vegetable or chicken, depending on your preference), butter or sunflower oil. Chop all ingredients. Heat butter/oil in pressure cooker, add all ingredients except stock, stir. After a couple of minutes, add stock. Close up pressure cooker, cook for 15 mins, and then do the same as for gazpacho, including leaving in fridge overnight. Serve with a dab of sour cream and chopped mint. 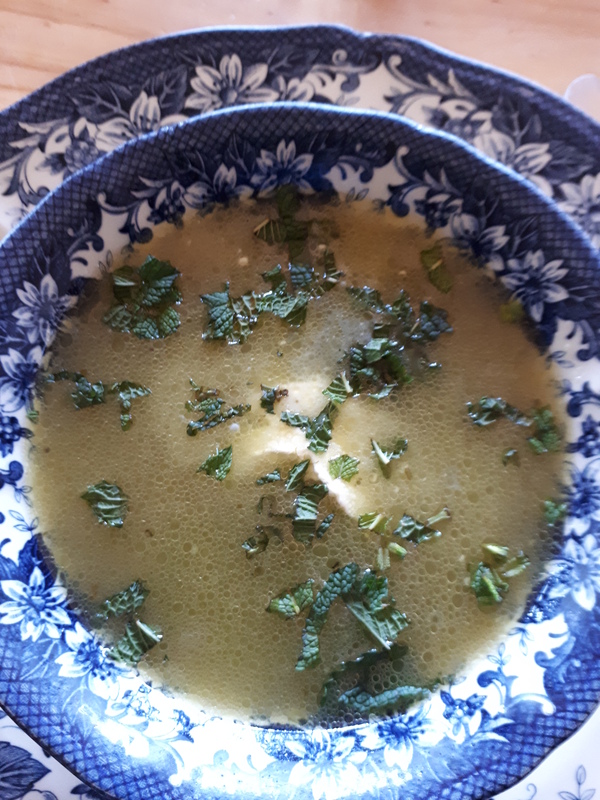 Version 2: Ingredients: 1 large cucumber, 3 or 4 zucchini (green or yellow), 1 stick cucumber, salt, pepper, garlic, onions, chopped herbs(a mix of of three or four leaves of sorrel, plus some thyme, is good, or your preferred mix), stock, butter or sunflower oil. To prepare and cook, proceed exactly as for the other soups!